Even though my phosphate meter is showing zero I know it is not totally true. I still get green algae film on glass and on circulation pumps and get nice dark green collection in skimmer. I am getting lots of green coralline and only a little of purple coralline growing. I have blue, pink and purple on my rock that I used for seeding. I don't mind green but I would like to see more of the purple and blue coralline growing. I may just have too much light. I have 2 bubble and an Indonesian Scolymia sp (doughnut coral) that are not doing so great, they're still extending their tentacles, albeit poorly. But there's part of their skeleton that has turned black. The coral refuse to extend near the black area of the skeleton. Should I remove the dying part, and how the best way to do it? I suspect the infection started because the bubbles fall from the rock near a lobo coral. calcium 400, alkalinity 9, magnesium 1200. My second question is why these corals are not doing well (I also have several other LPS not doing so great although they're still extending). My system is 90g, with an oversized DIY skimmer (rated for 150g) running non stop, NP-Biopellet reactor, and Rowaphos fluidizer. Additives are Grotech Ca, Mg, and Alk supplied daily via dosing pump (balling light). Lighting is DIY 3wx32 LED fixtures, mix of Royal blue and cool white (50/50). Do you think the light is overkill as some of my LPS won't extend their polyp in direct light? SPS seems to be doing fine of course. Or is it lack of nutrition from over filtration? Do you think I could benefit from using a timer for my skimmer? Would a Biopellet reactor and RowaPhos fluidizer benefit from timer instead of running 24h non stop? I have a follow up question though, if I remove the biopellet and Rowaphos filtration. How do I keep the nitrate and phosphate in control? I've been told that a skimmer does not remove these two elements. And I fear another algae/Cyano outbreak. I do heavy feeding (twice a day, half a cube each) as I have a couple of Squampini Anthiases. I am losing my mind and I am hoping you can help me out. I have a long-established FOWLR tank (4 plus years). It is 55 gallons with just shy of 100lbs of Fiji live rock (long time in tank). I have only 2 fish in the tank (one 6 line wrasse and 1 yellow tang) that are healthy and doing fine. 1. I added new substrate to try and increase the sand bed (I would say it is up to 4 inches). 2. I added an Aqua C Urchin skimmer to my existing sump that already had an Aqua C EV 120 skimmer in it. 3. I reduced feedings dramatically from every day to 3 times per week and eliminated giving flake food, only frozen. 4. I continuously vacuumed out the slime. 6.Changed and upgraded all of my cartridges (carbon, silica buster, etc, etc) and the RO membrane plus added a TDS monitor to my existing Spectra Pure 5 stage water filter system that I have always used for my tank and refill water. The tech support Spectra Pure guys said that as long as the TDS monitor reads "0" which it does then I should do a massive water change (about 50%) which I did 3 weeks ago to rule out water as the nutrient source. I have since done another 20% water change and the slime keeps coming back after I've vacuumed it out! I have spent so much more money and time trying to make this problem go away that I am at wits end at this point. I have only 2 fish that I feed sparingly. I have the best quality water technology can give me, and I have long since cured live rock in the tank with 2 skimmers running so why am I not seeing any improvement?????? So I need to give it more time? I have read all of your entries from the website on limiting nutrients to cure this problem and I think I have done that but with no results!! Where can the source nutrients be coming from with so few fish and good quality water??? <In a system four years old, the nutrients are likely coming from the sand bed. Whenever you change water do you vacuum the sand bed? You will be quite surprised at what comes out of there. Have you ever tried Boyd's Chemi-Clean? I have vacuumed the sand but that doesn't seem to help either. I also have rinsed the food with no luck. I do not have filter pads which need daily changing in my SpectraPure, only cartridges which are brand new. I did not provide nitrates and phosphates data because I have wasted money on inaccurate and hard to read test kits. I just figured that if I improved the water quality which I did with the new cartridges and additional skimmer than the Cyanobacteria would gradually go away (which it did in the past). I also increased the sand bed based on Bob Fenner's recommendations, so who do I believe??? I'll try those products you mentioned, ahh spend, spend, spend more money! Thanks in advance for allowing me to waste your precious time. First off I am 16 and I run my own small aquarium maintenance business (for almost 2 years now). I have some experience in dealing with aquariums and fish because I helped run and manage a aquarium store for 3 years (recently closed do to a lack of money). One of my customers has a big problem with phosphates and nitrates (saltwater tank with a couple of corals, live rock and fish).As a result of this(or at least I believe it to be a result this...please correct me if I am wrong) the tank has had several nuisance algae in the past few months, such as hair algae, a different one that looked similar to hair algae but a lot more slimy, smelly and quick growing. 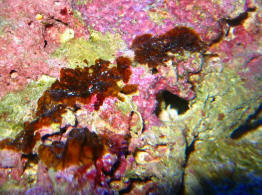 Most recently however there seems to be a bloom of cyano-bacteria. The tank is about 9+ months old. I have tried lowering the phosphates and nitrates by making sure not to over feed, doing frequent water changes, using filter media such as a poly filter pad, Chemi pure, Rowaphos and others. Could this problem be from a lack of biological filtration? what do you suggest I do to solve this problem? Another question I had is, is there a danger in putting to much phosphate removal media in the filter? (like Rowaphos, phos ban etc). My question pertains to a 6 month old Reef aquarium in which I cannot beat bad algae problems. The problem is a combination of algae on the tank glass (mostly green, occasional brownish) and extensive green long hair algae. The glass I have to clean at least twice a week and the hair algae I can't keep up with it. What I've read in a few of your other replies and the fact that most of the hair algae is growing on the Tufa rock (now spreading to the live rock though) leading me to suspect this as the cause. is there anything else I should look at as well? If you feel the Tufa is at fault is there anything I can do other than remove it (it's the base with live rock all cemented on top of it)? Will the Tufa eventually leach out all its phosphates? Is there any product that will neutralize it (without harming tank)? I was going to get a PhosBan reactor, but the way things are going I feel it a waste of money at this point. your site is one of the first that seems to raise concerns about its use. I've detailed my tank and my efforts below in case it helps. Water change once per week, 10 to 20% depending on need, includes vacuuming of substrate. Tap Water for Salt mixed water changes and De-ionized Water for the fresh water top up (don't have an RO system). Tap water seems low in Phosphate (around .01 or so). Clean glass twice per week. 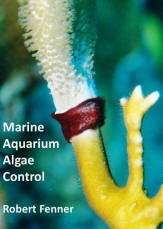 Pluck Hair Algae at every water change. Taken out and left out smaller loose rocks which were covered in hair algae. Charcoal in Sump. Various Phosphate products in Sump over last few months, including ROWAphos, Phos Guard and Phos-Zorb. Tried reducing lighting even more (only one strip 7 hours a day), doesn't help. I have been having a bit of a struggle maintaining a low phosphate level. I even have a phosphate reactor and it's difficult to stay below 0.5. Most of the time it's right at the 0.5 level -- unless I have recently changed the media. Then I can get 0 to 0.25 for a week. I only use RO/DI water and test it to ensure the filters are doing the job. Could it be that I am introducing phosphates as I feed frozen Mysis shrimp? and then feed with a turkey baster. I have read many of your links and posts, and I feel I am fairly knowledgeable in reef keeping. This is the exception, in addition to water quality, current, lighting, etc. will TLC Marine SAT - Hair Algae Remover for Reef & Saltwater Aquariums help remove unwanted algae, and if so, is it safe for a reef tank with the normal live sand, corals, fish, etc? Over the years, WWM has provided me with answers to the many questions that have arisen as owner of a saltwater aquarium. Many of the solutions suggested have been of great help and are greatly appreciated. However, at the present moment, I am faced with a nuisance algae problem that I cannot solve. Since moving my 75 gal reef tank (with 30 gallon refugium) about six months ago, I have been unable to get rid of the algae problem (somewhere between Cyanobacteria and brown algae in color) that I am currently faced with. Despite doing weekly cleanings and water changes, the algae (or whatever it is) will not subside. I have reduced the amount of food given to the fish and also reduced the amount of time that the lights are on in both the display and the refugium (10-12 hrs/day). has 4 65 watt PC. Livestock in the tank is as follows: small clownfish, blue hippo tang, purple tang, polyp colony, snails and a couple crabs. My parameters are as follows: SG - 1.024, PH 8.2, NO3 - 0, NO2 - 0, Ammonia - 0. Since moving, the Chaetomorpha does not seem to be doing well. It is covered on top by red slime. When I look at the layers underneath, it seems to be in fine shape. All the small critters in the refugium seem to be doing alright. In looking at the water surface in the display, there is a film on top. Additionally, my protein skimmer is quickly clogged and needs to be cleaned out completely once every two weeks in order to maintain good operation. I don't know really where to go from here. Should I look into a new skimmer? Do I need more rock? Is the decline in the Chaetomorpha contributing to the algae problem? What would you recommend I do to help combat this problem? I just want to make sure that I am providing my fish and other marine life forms with a great place to live. Anything you could suggest to help me out would greatly appreciated. Thanks again for providing us with a great resource in WWM. Since all systems seemed different I was unable to get any answers to my problem. You mentioned not enough circulation as possible one aid, protein skimmers, excess lighting and so on. I have a 90 gal. display reef which is run off a 100 gal unlit sump and a 30 gal frag tank that also runs off the sump. This baffles even my supplier as "everything is right" (apparently not) according to him. I do not use a bio filter of any kind relying on the live rock. I do have Eheim wet/dry canisters at the ready if you recommend them, which so far I have been advised against the use of (my supplier said their use would come back to haunt me down the road) but to rather rely on my live rock, all Fiji Island real stuff. The display tank is lit by 2-250 watt 14,000K bulbs. For circulation I have about 700 gph being circulated up from my basement sump. I have a Fluval FX5 kicking the circulation at 925 gph (running empty). I also have two Hagen 802 powerheads adding an additional (est.) 440 gph each. This tank really churns. but only run carbon about once a month. I use strictly Salifert test kits so I know the following readings are quite accurate. calcium 450 ppm (as best I can as this system eats calcium at an incredible pace so I am about to add a calcium reactor). I've been a reef hobbyist for over 20 years and I have never had such an out of control green hair algae problem like this one. but even my army of snails can't control this. My sand bed is less than 1" deep in the display tank. In the sump it is about 4" but kept vacuumed as this is where we do our water changes from. My frag tank is also shallow in sand, has a 150W, 14,000K halide and is on an alternating time schedule. Halides are on for 8 hour periods, no other source of light. I have spent a fortune on this system (I am also a serious planted wild caught discus hobbyist) and I am ready to call it quits. This tank is not an enjoyment anymore, more of a nightmare. PLEASE HELP, I'VE BEEN FIGHTING THIS PROBLEM FOR A YEAR NOW! I thought I would share a bit more. My other problem I have had in the past is with our FX5 being loaded with any form of media or sponges. Being the ultra powerful filter it is, it is capable of drawing from as far away as 4 ft. This has resulted in major air bubble production. Our reef looks like a blizzard in the tropics. This is why I have been running the FX5 empty. The first thing I put any kind of anything in it we get "whiteout conditions" on my reef tank. I will remove the powerheads so as there is less oxygen feed to the FX5. The reef was much cleaner with the FX5 loaded but the corals could not take the bubbles and all retracted. My supplier called Hagen on my behalf today looking for a solution to the air bubble problem with the FX5. Between us, we have not been able to stop this problem to date. We have tried about most everything he carries in his store but no success to date. Do you have any idea what might help with breaking up this bubble problem? In the meantime he is going to order me a new, better membrane. The skimmer we have been talking about is an Octopus Extreme (200 gal.). Is there something you would recommend more? Incidentally the Coralife skimmer's cone and collection cup are cleaned daily. The impeller and bubble column are cleaned monthly. Yes, you are right, "Coralife skimmer"
As to my husbandry methods.....minor details!!!! I feed strictly frozen foods about 3 to 4 times a week and only a cube at a time. I only have a few fish on the reef, a clown, a Sailfin tang, a beta, a Banggai and a goby. The reef itself is heavily populated with soft polyped stony corals. The display tank probably has about 150 pounds of live rock, about 8 inches from the water surface. We water change at about 25% once a week normally unless I fall behind but we try to stay on top of our water changes regularly. Being into discus we know all to well the value of "keeping up". We have ultra soft tap water but I run every last drop through my RO. My tap water tests at 6.2 pH and no nitrates or phosphates. We replace the fiber cartridge monthly. We recently replaced the DI and carbon cartridges (upgraded brand my dealer ordered special for me) as well but to no improvement. Yes my dealer did recommend we replace the membrane if this doesn't work which it hasn't. We have not gotten around to replacing the membrane but I will order one today. Yes we have considered buying a stronger skimmer. What would you recommend? My dealer thinks we should go with an Octopus (sp?) but a more professional grade one as money is no object at this point in time having spent so much already. We just really need to get this thing straightened out. It has been so frustrating. Our dealer is going to a big aquarium show this month in Florida and asked if I wanted anything special. I will order the skimmer you recommend and was also wondering about a calcium reactor? Regarding the hard/Alk. = OOOPS, 11.2 to 12.5, usually to the low end of that. I'll raise my pH as well. It is usually about 8.3 to 8.4. Thank you so much. This has been a real tough road. I know so much but yet so little and is so incredibly frustrating. We really do appreciate all your time and help Eric. As always, thank you for your great site. Over the 4 years that we have had our reef tank your help and advice has been invaluable! - 75 G Oceanic reef ready bow front with a 20 G Eco Systems refugium, about 80 lbs. of live rock. - Water quality: 77.5 degrees F, 1.025 SG, 8.3 pH, 5 ppm Nitrate, 0 ppm Ammonia & Nitrite, 420 ppm Ca, 1470 ppm Mg, 7.0 dKH and 1 ppm PO4. - 15% water change every Friday using RO/DI water with 0 ppm readings on the meter. - 3 feedings per day with a mixture of liquid, frozen & dry foods. I have two areas where I need your advice (without which, I am reluctant to do anything in this tank). 1. High phosphate level. Due to ???. I'm getting a PO4 reading of 1 ppm (confirmed with 2 different test kits) which I understand to be very high. I am experiencing some hair algae growth and CBA (CBA mainly in the refugium). I use RO/DI water (which I have tested a 0 ppm PO4) and I have tested the new salt water before the water change at 0 ppm PO4. The substrate is about 2 to 3 inches deep. All of the corals are healthy and growing. I do not now where the PO4 is coming from (the substrate?) or how big a problem this is. So, I'm confused and could use some advice. <Two possible causes - 1st, how much are you skimming out of this tank? Your skimmer could be undersized. 2nd: Three feedings a day is excessive, especially with liquid foods - those should be used no more than once or twice a week. 2. Stocking question. Should we add a "Lawnmower" Blenny (S. Fasciatus), or not. Recently, after 3 years of healthy living, our Mandarinfish (Synchiropus splendidus) died. We intend to replace him with another Mandarinfish. <Do give the pod population time to replenish itself before adding another. 75 gallons is on the edge of being too small for a Mandarin. They need a large tank with a healthy pod population. We would also like to add a "Lawnmower" Blenny (S. Fasciatus) but have some concerns. 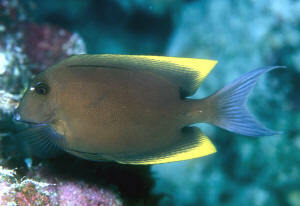 In researching this fish I understand that they can be quite territorial, even belligerent. Given that we are going to have a Mandarinfish and that our clownfish have taken up residence in a Zoanthid coral on the bottom, right corner of the tank, should we add the Blenny? The thought of a bullying Blenny bothering the clownfish in their little home is untenable. But we need an algae eater and I love the way these crazy looking "Lawnmower" Blennies look. Thanks so much for your quick response! However, I have a couple of follow up questions. food in the tank, or both? The liquid foods we use are made by Reef Nutrition. We use their Phyto-Feast, Oyster Feast & Arcti-Pods. The first two are for the corals. The frozen foods are made by Bio-Pure and we vary the types between feedings. Also, it was my understanding that 3 light feedings per day was ideal. Wrong? If so, what would you recommend? By the way, the skimmer that we use is the one that came with the Eco-Systems refugium that was specified for this size tank, so I hope that's not undersized. 2. Regarding the stocking question, if we decided not to replace the Mandarinfish, would the Lawnmower Blenny be OK? Our Tang, while it does peck at the rock, couldn't be described as a voracious algae eater (at this my wife says maybe because we're overfeeding!). Once again, thanks for all of your help!! 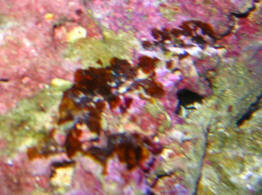 Re: Please help me ID and get rid of this Brown Algae 8/29/07 Hi Bob. You helped me identify some algae in my tank as Peyssonnelia sp. a few days ago. I noticed tonight, that over the last week, this algae seems to be declining. <I see this> I attached a picture I took a week ago, and a picture I took tonight. The pictures are of the same exact spot on the rock. The only thing I've done differently over the past week, was I ran activated carbon for 3 days, per your recommendation for my mushroom corals that were limp and you thought might be caused by chemical warfare (forget your exact term). <Perhaps allelopathy... "disease to others"> Could the carbon have helped at all with this nuisance algae by removing undesirables out of the water? <Of a certainty, yes> I hope to see it all vanish soon!! Thanks! Question: I've had a 55-gallon reef tank now for 4 months. At first I used tap water and added Novaqua to remove the chlorine and stuff. Brown junk started growing everywhere after about a month and I was told it was because of phosphates in the water and to start using RO or distilled water. I got the phosphate pads to clean out the tank water and since I don't have easy access to RO water I started using distilled water. Now someone else has told me distilled water is "dead" and NEVER to use that and to either drive some distance to get the RO water or buy my own machine. What is a good machine to get...is it RO or RO/DI (or are those the same thing?) or 2-stage, 4-stage, automatic cut-off...HELP!...too many options considering I'm not even sure what it does and how to use it. I do eventually want to upgrade to a much larger tank so I don't want to get something that is too small for my needs later on. Just tell me the best kind to get for the money...I also am having an outbreak of hair algae...I have a CPR Bak-Pak protein skimmer along with the hang on the back of the tank "Emperor system", 2 stationary power heads and one rotating power head, and VHO compact bulbs (one blue, one white...about 200 watts total, which stay on for 7-8 hours a day) and only feed the fish once a day...I have about 12 blue-legged hermits, 6 red-hermits and 12 snails (Astreas and Turbos)...why the algae...it seems to be getting worse...is it because of the distilled water...I've checked for phosphates and there are none...how to I get rid of it?